When people watch TV today, many of them will do so with another device, like a smartphone, in their hand. As a result, the traditional “Call 1-800” and “But, wait, there’s more!” are no longer needed. A soft call to action is all that is necessary to make a TV ad interactive and drive response, without damaging the brand. We like to refer to such creatives as “brand response” ads. Geico is a great example: its campaigns included elements of both direct response (e.g. “15 minutes can save you 15%”) and brand (a friendly, relatable gecko). Some of the Peloton creatives achieve a similar perfect blend: they explain the product and encourage the viewer to join (“Let’s go”), yet also appeal to people’s aspiration for being a better spouse or parent by exercising at home, which equates to brand. In that sense, a good TV DR campaign should aim to also measure the brand impact. This does not suggest a brand awareness study conducted via surveys. Instead, it should be a statistically-relevant approach that tells advertisers which viewers responded to the TV campaign later in time. This measurement can be done with a closed-loop study. 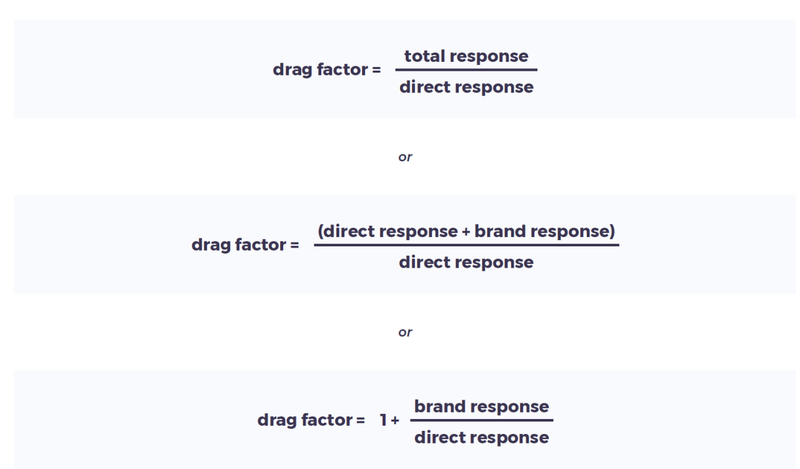 To understand how the latter works, we first need to quantify the relationship between direct and brand response via the drag factor. As can be seen in the figure, direct response is immediate, which means that it can be calculated by measuring the key-performance index (for example, cost per visitor or cost per install) within minutes after an ad has aired. Brand response, on the other hand, is latent, and cannot be measured directly because it occurs later in time, possibly even months after the ad aired. The drag factor is a number that quantifies the relationship between these two types of response as a multiplier. To perform a closed-loop measurement, we use viewership data. Viewership data provides information on the exposure of an anonymized IP address (which is usually synonymous to a unique household through the home Wifi router) to a specific spot airing. By matching the IP addresses of TV viewers who were exposed to the creative with the IP addresses from the website, we can isolate viewers who were exposed to the ad but only went to the advertiser’s website later in time. Hence, we have “closed the loop” between the TV ad and the website or app store visit. Closing the loop enables us to build a response maturity curve, which plots viewers’ response behavior as a function of time. In plain English: it lays out the likelihood of TV viewers visiting the website or installing an app at a particular point in time after last seeing the ad on TV. An example is shown in the graph below. 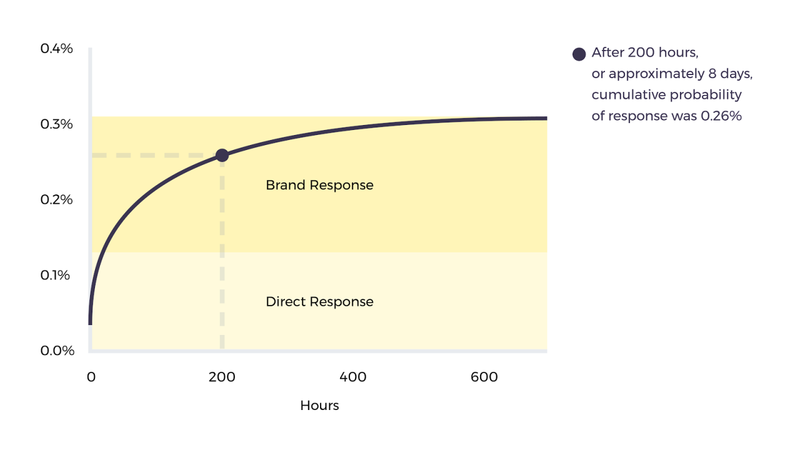 The horizontal axis displays the time (in hours) since airing that a viewer responds to the ad, while the vertical axis represents the probability of total response. Therefore, t=0 corresponds to direct response, and a strong DR ad will yield a big spike in the curve at this time. The curve then grows, asymptotically converging on its steady-state value with each time point corresponding to a particular probability of total response. For instance, after 8 days, or approximately 200 hours, the probability of total response was around 0.26%. Since most TV sets sold today are IP-enabled, these calculated probabilities become increasingly representative of the overall TV viewing population. More importantly, these probabilities of response enable the calculation of client-specific drag factor. Phrased differently, we have found that, a month after seeing an ad, our client is finding 1.22 additional brand responders for every direct responder. This way, we have precisely measured both the direct and brand response components in the campaign instead of merely modeling or surveying them. Of course, as is the case with every measurement approach, closed-loop studies have their limitations. The obvious one is that viewership data is expensive (except for Tatari’s clients). It is also important to note that ‘brand response’ in the context of closed-loop studies refers only to the delayed effect of a direct exposure to a TV ad. In other words, closed-loop studies cannot measure delayed response that happens as a result of an “offline” or indirect exposure to a TV ad. This can include word-of-mouth recommendations between friends, seeing the advertiser’s TV ad at a friend’s house or in a bar, hearing about an advertiser on news or social media, and so on. That said, by providing greater insight into the brand impact of DR campaigns, closed-loop studies can give advertisers a peace of mind as they spend their dollars on TV advertising. That’s why we encourage our clients to produce DR creatives that hold brand-building elements, which we can objectively measure. Eventually, the brand will have a positive impact on the company beyond measurable response: from halo effect, typically experienced with better performance in digital campaigns, to the use of the company name and brand in everyday lingo (e.g. “Shazam a song”).